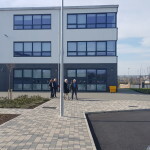 On Monday 25th February 2019, twenty two of our members visited the newly built Wexford Loreto Secondary School. In the bright and spacious foyer of the Loreto school we were greeted with a very warm welcome by the school Principal, Billy O’ Shea and Deputy Principal Chris O’ Reilly. Ms O’ Reilly gave a very short history of the school and mission statement, truth, freedom, justice, sincerity and joy. 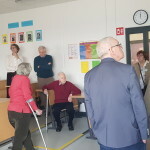 A tour of the school then took place starting on the ground floor. Located here are the technical Graphics & Material Technology rooms ( wood & metalwork), these are two new subjects offered to students. The rooms looked really impressive, very spacious rooms with very modern equipment. We next proceeded to the second floor, which can be accessed by lift or stairs, we viewed the home economics room, very modern science lab, language class rooms, all fitted with new computers. 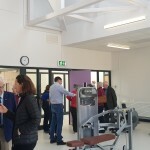 We also viewed the fully equipped gym and gym hall. All the classrooms are bright and equipped with the most modern technology to include overhead projectors. From the 2nd floor we had a great view of the outdoor sports facilities. At present there are 819 students and will increase to 900 over the next 3 years. It was a most impressive, enjoyable and courteous visit for our members and we were also greeted by a very warm welcome by all the staff and students that we met in the hallways.